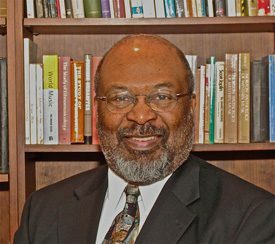 Lester Monts is an Arthur F. Thurnau Professor of Music (ethnomusicology). From 1993 until 2014, he served as senior vice provost for academic affairs and senior counselor to the president for the arts, diversity, and undergraduate affairs. He is currently director of the Michigan Musical Heritage Project that seeks to capture on film the state’s folk, ethnic, and immigrant music traditions. Monts received a bachelor’s degree in music education from Arkansas Polytechnic College, a master’s degree in trumpet performance from the University of Nebraska-Lincoln, and a doctorate in ethnomusicology from the University of Minnesota. In his former administrative role, Monts worked with the provost and executive vice president for academic affairs on matters related to budget, tenure and promotion, enrollment, and a broad range of academic issues. He oversaw operations of 15 academic units, ranging from admissions and financial aid to military officer education. Nationally, Monts served as chair of the College Board’s Board of Trustees. He has also served on the College Board’s Academic Assembly Council as Midwestern regional representative and chair. He has been a consultant to the Association of American Colleges and Universities, the Western Association of Schools and Colleges, the American Council on Education, the National Endowment for the Humanities, the Tubman Center of African Culture, and the Steven Spielberg/Dreamworks production of the movie “Amistad.” He currently serves as a senior consultant to the Chinese Language Council International (Hanban), which administers more than 450 Confucius Institutes located in colleges and universities around the world. Several Chinese universities and music conservatories have awarded Monts honorary professorships, including Liaoning University, Dalian Jiao Tong University, Wuhan University, University of Science and Technology – Liaoning, and the China Conservatory of Music. Monts has focused his scholarly research on the musical and cultural systems among the Vai people of Liberia and is regarded as one of the world’s leading scholars on music and culture in the Guinea Coast region of West Africa. In addition to writing books, he has published in scholarly journals and presented his research at the conferences of many national and international groups. A former professional trumpeter, Monts has performed with numerous orchestras, including the Minnesota Orchestra, the St. Paul Chamber Orchestra, the Santa Barbara Symphony, and the Santa Barbara Chamber Orchestra. He also served as principal trumpet for the Allegheny Summer Music Festival and the Music Festival of Arkansas. He performed in solo capacities with the Pittsburgh Symphony, Allegheny Chamber Orchestra, and the Santa Barbara Chamber Orchestra. His major trumpet teachers include Robert Bright (Arkansas Tech University), Dennis Schneider (University of Nebraska), Bernard Adelstein (Cleveland Orchestra), and Charles Schlueter (Boston Symphony). Monts has worked on the faculties of Edinboro University, University of Minnesota, Case Western Reserve University, and the University of California at Santa Barbara – where from 1988 to 1993 he served as dean of undergraduate affairs in the College of Letters and Science and directed the undergraduate honors program. Monts holds memberships in the African Studies Association, the Society for Ethnomusicology, the Liberian Studies Association, and the College Music Society. He is the past chair of the governing board of the University of Michigan International Institute, a member of the governing board and research associate of the International Centre for African Music and Dance, and serves on the advisory boards of the Sphinx Organization and the International Society for Improvised Music.